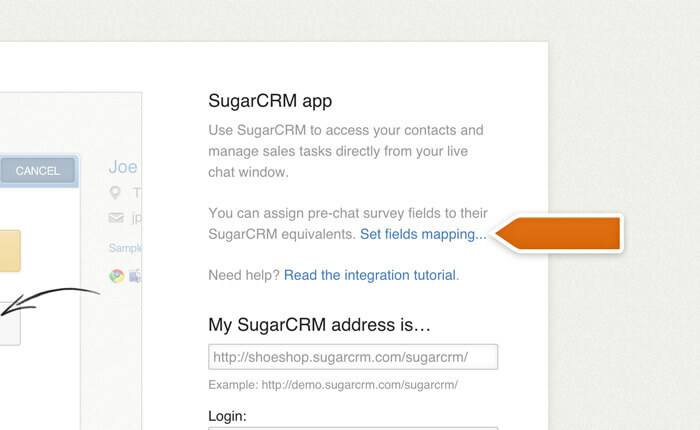 Go to the SugarCRM integration page and select Install application. Type in your SugarCRM address. Download the LiveChat SugarCRM module. Log in to your SugarCRM as admin. Scroll down to Developer tools and select the Module loader. 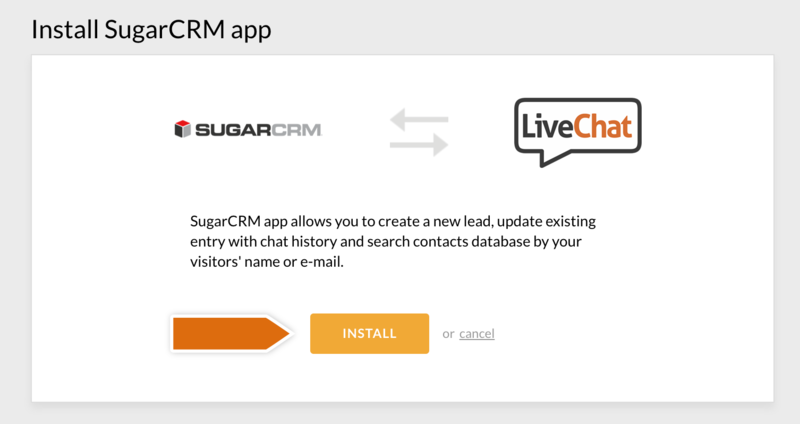 Click on Choose file, select the LiveChat SugarCRM module you’ve just downloaded and press Upload. 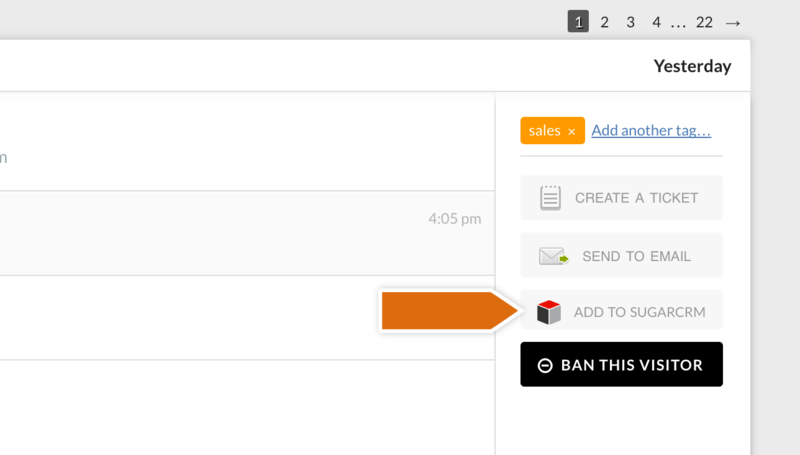 Finally, you will be required to Accept the LiveChat module license and click on Commit. When the installation is complete, you will receive a message that the module has been installed successfully. Now, you can start creating new accounts and leads from the chat window! In order to use this integration, you need to click on More in the upper right portion of the chat window and choose Add to SugarCRM. You can also add a contact to your SugarCRM from the Archives. Simply select a chat in the Archives and click on the Add to SugarCRM button. When you use this integration for the first time, you will be asked to provide your SugarCRM login and password. Type them in and click on Save to proceed. Next, you will get the option to create new Lead, Contact, Account and Opportunity. You can also attach the chat to a similar or an existing record. If you wish, you can modify the record. Finalize by clicking on Save. The record will now appear in your SugarCRM database. 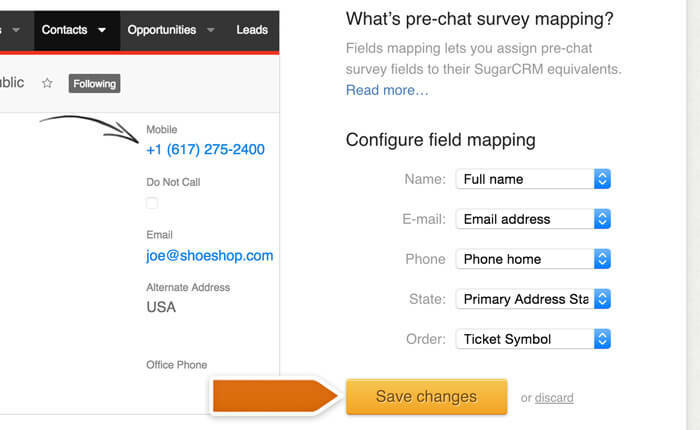 You can map the pre-chat survey fields to their SugarCRM equivalents to make your records more detailed. To do that, simply log in to LiveChat and go to the SugarCRM integration settings. Click on the Set fields mapping link to configure the fields. Depending on the way your pre-chat survey is configured, you will be able to map different types of fields. To map a particular field, simply click on the drop down menu beside a particular pre-chat survey item and select a SugarCRM equivalent that you want to assign to that item. When you are done, click on the Save changes button to finalize. Once you set up the fields mapping, all the contacts you create using the SugarCRM integration with LiveChat will be stored on your SugarCRM account with the additional data from the pre-chat survey.